OLYMPIA – Unless voters say otherwise, many Washington elected officials will get 16 percent pay raises during the next two years thanks to new salary schedules approved Monday by a citizens commission. All elected officials under the commission’s purview – statewide elected legislators and executives and judges at all levels – would see their base salary go up in varying amounts this July 1, and again in July 2020. On top of that, each position would get a yearly 2 percent cost-of-living adjustment. Tim Eyman, a regular sponsor of initiatives to limit taxes, said he will file a referendum to block the raises. Elected officials should be able to live on the salaries they accepted when they ran for their jobs, he told the Washington Citizens’ Commission on Salaries of Elected Officials. Current pay is “not a tremendous burden on their part,” he said. Under the new pay schedule, which becomes law unless the referendum is successful, the salary for a legislator would go up nearly 16.5 percent over the next two years, a combination of a $3,000 increase in their base salary each year and the 2 percent cost-of-living increases. That would raise the current legislator’s pay of $48,731 per year to $52,766 this July and $56,881 next July. The commission, which studied comparable pay for similar posts in other states and held monthly meetings around the state last year, pared back its increases slightly at Monday’s meeting. Commission members had initially scheduled annual cost-of-living increases of 2.5 percent. Commission member Larry Turner urged the board to be conservative with the increases because it can only raise salaries, it can’t reduce them. “We should be careful about big increases because we can’t take it back later on,” Turner said. The governor, attorney general and treasurer would get annual increases of $1,500 to their base pay, plus 2 percent COLAs each year. Gov. Jay Inslee’s annual salary would go from the current $177,107 to $182,179 this July and $187,353 next July. Attorney General Bob Ferguson would go from $162,599 to $167,381 this July and $172,259 next July. Treasurer Duane Davidson would go from $144,679 to $149,103 this July and $153,615 next July. Other state officials would get higher increases in base pay. Lt. Gov. Cyrus Habib’s base pay would go up $5,000 this year and $6,000 next year before the COLA was applied. Senate Minority Leader Mark Schoesler, R-Ritzville, wrote a letter objecting to a large increase for the lieutenant governor’s office, noting that whenever the governor is out of state, the lieutenant governor takes his place and receives a salary boost. 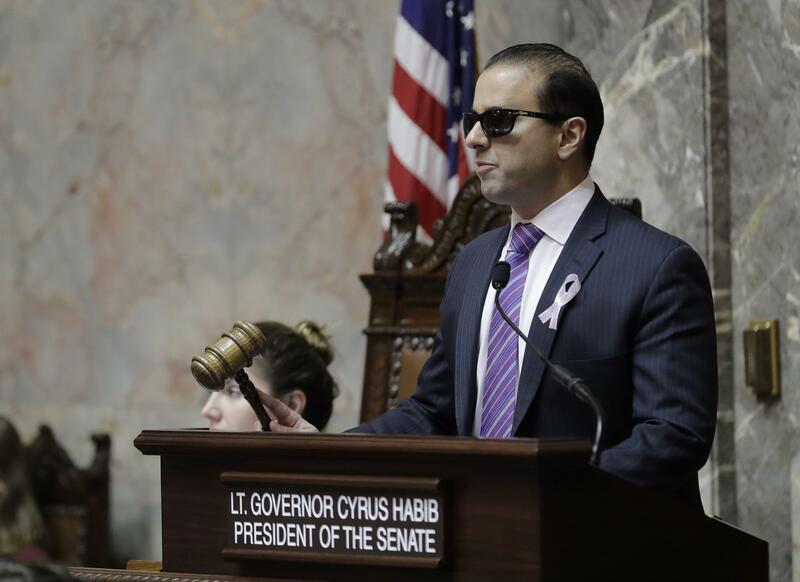 If Inslee runs for president, he’ll be out of the state more this year and next, and Habib will get more money because of it, Schoesler said. The commission will study the salary effects of the lieutenant governor’s role of filling in for the governor for future changes to the salary schedule. Asked what he thought about the roughly 16.5 percent increase scheduled for legislators, Schoesler said he’d leave that up to the commission. The commission also called for judges to get an 8.5 percent increase in base pay in July 2019, and a 2.5 percent increase next July. On top of the increases to base pay would be the annual 2 percent COLAs. Under state law, the new schedule for elected officials will go into effect unless Eyman or someone else files a referendum and collects the signatures from 129,811 registered voters within 90 days. Since the state salary commission was set up by a constitutional amendment in 1986, that’s never happened.